This project is joint with the Government of India and the Global Education and Leadership Foundation (TGELF), based in New Delhi. The field study is examining the impact of an innovative school-based curriculum to cultivate values related to ethical leadership at the grass-roots level. In October, 2016, we piloted games at 16 schools in the state of Rajasthan. The results suggest that students at tGELF schools have a greater level of honesty and civic trust than non-participants, and a greater tendency to think critically about their leaders. In the summer of 2017, we expanded the study to additional districts, get a broader assessment of the program’s impact and examine the heterogeneity of impact across diverse groups of children. The Indian government has made considerable investments in mobilizing women in rural areas. In 2013, the flagship National Rural Livelihood Mission (NRLM) had a budget of $5.1 billion, and the project continues on today. 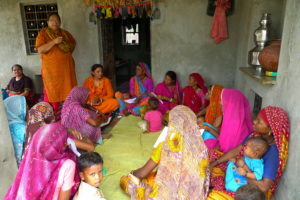 It aims to “establish efficient and effective institutional platforms of the rural poor that enables them to increase household income through sustainable livelihood enhancements and improved access to financial and selected public services.” The program is organizing the poor through a network of field-workers, who work at the grass-roots level to organize women into Self-Help Groups (SHGs) and build their capacity for self-employment. The field-workers are a diverse group. 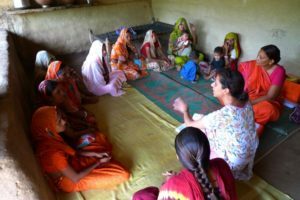 Some work for reputable NGOs, some work directly for the Indian government, while others are former SHG members themselves who successfully organized themselves into federations in the past and are now serving as an example to other community members. Our study examines this movement in the state of Rajasthan where the NRLM has been implemented together with the World Bank. Our work compares the approaches used by the field-workers. Live data from MIS systems are used to compare the effectiveness of their strategies. Qualitative research was examined to construct a survey instrument that wa then administered to community resource persons, field-workers and individuals who actively participate in mobilizing poor rural women into SHGs. The study aims to contribution to the academic and policy-focused literature on the design of large-scale poverty alleviation programs. The objective of the study is to document the health effects of continued domestic river pollution across India, especially as an inter-jurisdictional phenomenon. It therefore will assess the health burden of river pollution locally and in downstream districts. In quantifying age- and pollutant-specific health impacts, the study aims at isolating the types of river usage that are most harmful. The work is joint with Samuel Stolper (University of Michigan) and Quy Toan Do (World Bank). It is currently funded with a grant from the International Growth Center. Conditional cash-transfer (CCT) programs — cash payments to poor households conditional on participation in education, health and/or nutritional programs — have become popular in developing countries. In recent years, CCT programs have also begun to focus on maternal and child health (MCH). One of the largest and most impactful of these programs is the Indian Janani Suraksha Yojana or Safe Motherhood program. Established in 2005, this initiative provides poor women with a financial incentive for receiving pre-natal care, deliver their children in existing public or private health facilities (or at home with proper medical supervision), and receive timely post-natal check-ups. The overall objective of the program is to reduce maternal and child mortality and accelerate India’s progress towards meeting MDGs 4 and 5, as well as improve women’s overall access to health care. With more than 9.2 million beneficiaries, and a budget of nearly 15 billion rupees, the JSY is one of the largest CCT programs in the world. In a series of papers, I am evaluating this program. My first paper is joint with Anusuya Sivaram, who was a student at Georgetown University. In a subsequent paper, I plan to explore some political dimensions of this program.